If you watched Masterchef SA you have seen this talented “chef” on TV already. 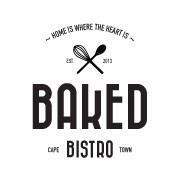 His name is Zahir Mohamed and he is the man behind Baked Bistro in Bakoven, Cape Town. Baked Bistro opened up its doors earlier this year and with “wood fired pizzas, gourmet burgers and artisanal sandwiches” on the menu it is well worth a visit. The next step is (off course) to brew their own beers at Baked Bistro. The plan is to launch the first beers during winter and I hope it all goes to plan. When asked about a picture on a Baked Bistro bottle of beer they quickly responded that they “will announce when the Baked beer is ready for trade. [We are] just finalising a few things”. Go and check them out and ask for some Baked Beers.